we are experiencing our 'truffles' being slightly lame on her front right leg, but only when she's been resting, so it's when she gets up for a few minutes. She has been to the vet who can't find any problems. She has been on metacam now for about 2 weeks, but still has the problem. We know she's as mad as a hatter and is like a box of frogs, has anyone else experienced the same in their coton? Any advice would be helpful, thanks. (Truffles is now 10 months old and is a beautiful little girl like all cotons). This may be off the mark for your Coton, but just in case... 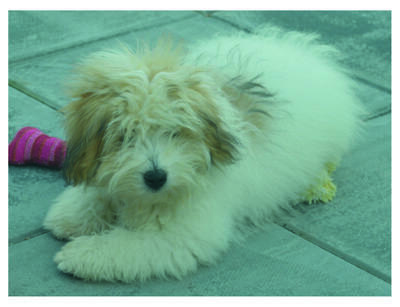 The terrier mix we had before our Coton, had very similar symptoms. Our vet wasn’t able to identify a problem either. Long story short, we eventually figured out it was the harness she was wearing for walks (she was a puller). The "lame" leg issues went away when we switched to a collar (pulling got better too). Please take Truffles to a vet trained in canine orthopedic medicine for exam and X-rays. Our Cody (9 mos) experienced similar problem with walking. Four weeks ago he had the first of two operations on his forelegs. Forelegs were diagnosed as having developmental problems. Won't go into details, but urge you to get Truffles checked out. thank you so much for your comments, I will definately try your suggestion. These dogs are so loving, I wish I had discovered them years ago. I love my other 2 dogs, a maltese and a Cavalier King Charles, but our Coton is one on her own! My Coton, Bijou had exactly the same problem at about 1 yr.
she had an X-ray and it showed that she had a very slight tear of the cartilage. She was prescribed Stride Plus a " ...complimentary feed supplement for the nutritional maintenance of healthy cartilage and joints in dogs". This has helped her a lot. One squirt of the liquid into her morning food was all she needed. After a fortnight she did not limp. It costs £64 but last for ‘ages’. Now I give it to her once a week . Hope this helps. I live in London,UK so the meds is available here. You can also buy it on Amazon.